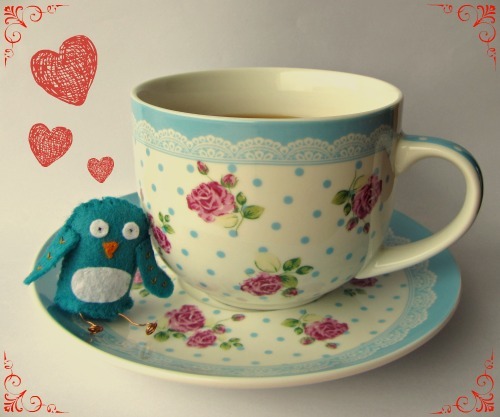 Let’s face it: running an online craft business involves a lot of tea drinking. Some fellows crafters says they love being able to work in their pyjamas, I mean yoga pants, and watch daytime television now and then. If you ask people who don’t have a clue they would say it is about stitching/drawing/knitting/what-not-hobbying all day with not a care in the world. As far as I am concerned I never work in my pyjamas, may watch some tv on my lunch break but mostly enjoy the freedom of being my own boss, making my own decisions, getting to know my infinite skills a bit more everyday and getting to create/design/make everyday. However there are some aspects of the crafty and working at home life that could be lead anyone in depressed mood if not carefully managed. No boss. But no colleague, no chat next to the kettle, no gossip in the bathroom, no after work pub on Friday. This is the most difficult part of my work I would say as I am a real team player and always enjoyed my peer support in the work area. But until I can hire a team I have to be happy with myself. Some ways to feel less lonely: social media (Twitter is my fave), forums and virtual groups (there has to be something for you on Facebook or LinkedIn). There are also groups meeting in real life to help self employed with networking but this is also a great way to meet people and chat over a coffee. A big trap in the craft industry is the extent of what you could do. It is so easy to go in every directions at the same time, I’m sure all beginners has made this mistake at some stage. Remember: you may be very crafty and able to do a lot of things but you must stick to what will make you achieve your goals. Then even if you know your goals it is very easy to get distracted by the latest trend. Be ruthless: write down your goals, set priority order, stick to it. Level 3 – advanced – is being able to keep going toward your goal while staying aware of outside inspirations. Here is the secret guys: walk straight to your goal but still listen to the world so your work gets richer. I didn’t say it wasn’t tricky. If you work in your home, your house is your office and your office is your house. There are lots of resources online with great advice about this issue. What works for me is a despotic schedule. There are times I am not allowed (by me the boss) to attend my house and other ones I am not allowed to work on my latest project. You need focus to be productive. You need rest to stay productive. Keep the late nights and week-end working sessions for very busy times because it is also very important to have some spare time for last minute rush. Walking to the office is a great way to exercise daily. Unless your office is in the dining room. Seriously: moving your body is very important for your health. Run up and down the stairs if you wish. I prefer walking at least 30 minutes each day, practising yoga now and then. I also choose my feet over the car every time I can. An other important thing: take breaks because your eyes will burn if you sit at your craft table for 8 hours non stop! This said, I wouldn’t change careers for anything. Once you know the traps, you can work around them! Next Post Give them a cottage!